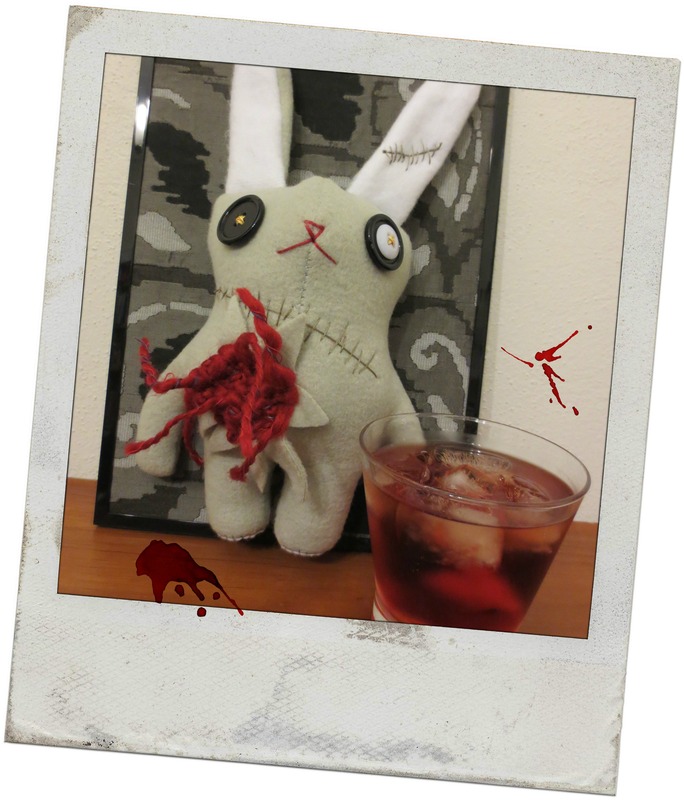 Nigel the zombunny hoped that was a glass of blood in front of him. He just didn’t have the stomach for a Negroni. In the lead-up to World Gin Day (June 13), it’s Negroni Week – that’s right, a whole week dedicated to one classic cocktail made of equal parts gin, Campari and vermouth. Bars around Melbourne are celebrating by donating money to various charities when customers order a Negroni, and while I really wanted to support this excellent excuse to drink, I dislike Campari so I was pretty sure I wasn’t going to like Negronis, either. And if there’s one thing worse than drinking a cocktail you don’t like, it’s paying for it – even if that money is going to charity. I still wanted to join the festivities, though, so I donated to charity by buying a cocktail book at an op shop and making a Negroni at home. It couldn’t have been easier to make, though it was slightly disturbing seeing perfectly good gin (my favourite spirit) being sullied by bitter Campari and turned blood-red by the vermouth. And it couldn’t have been easier to decide who’d drink it; I took one sip, immediately declared I had made a horrific mistake and handed it to the CTO (Cocktail Tasting Officer), who guzzled it, saying it was a brilliant cocktail that reminded him of the bittersweet soft drink Chinnotto…which I also don’t like. Even diluted with some soda water, the Negroni was just too bitter for me. Turns out you can like bitters, be bitter, and still not like bitter things such as Negronis. Who knew?! I’ve read somewhere that people either love or hate Negronis – there is no in between. Based on 52 Cocktails’ scientific studies, aka tonight’s drinking session, I’d say 50% of people love them and 50% hate them. For the first group, here’s the recipe. On behalf of the rest of us – leave our gin alone! If you can pour liquid out of a bottle, you can make this drink. Whether or not you can stomach drinking it is another thing altogether. This version of the Negroni appears in The Liquid Kitchen – Party Drinks by Hayden Wood (Murdoch Books, 2004). Other recipes call for 30ml of each ingredient. If you really, really like Negronis you could probably make a massive one as long as you used enough ice and equal measures of all three ingredients. Sorry, but it ain’t something I’m ever going to try! No animals were harmed in the making of this photo. Nigel the zombunny, however (supplied by Make it Wednesday), has been well and truly traumatised.